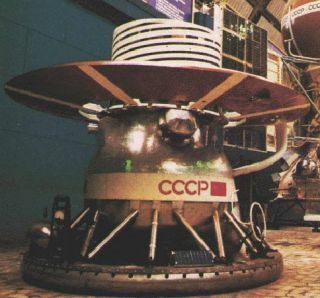 The former Soviet Union's Venera-13 and Venera-14 were identical spacecraft, both successfully landing on Venus in March 1982. Beefed up imagery taken from the hellish surface of Venus nearly 25 years ago is offering new glimpses of that strange landscape. Don Mitchell of Redmond, Washington is a retired researcher from Bell Labs and Microsoft Research. He has matched his computer science and image processing skills with a passion to study old Soviet spacecraft data. One result of this high-tech harmony of interests has been a relook at imagery relayed via twin Venera-13 and 14 probes that landed on Venus in 1982. Processing of the Venera lander imagery was done in several stages, Mitchell explained. The biggest task was first taking multiple transmissions-live and from tape-then merging them to produce one very clean master copy of each of four spacecraft cameras. Venera-13 and 14 each had two cameras. A new camera calibration function was calculated. That conversion teased out a lot of the very dark and very light regions caught by Venera cameras, Mitchell said, detail not brought out in the original Russian photo reduction work. Surprisingly, in the case of Venera-13, distant hills hazily seen were clearly revealed. To produce the images, Mitchell mixed in in special purpose source code, resampling, and other image wizardry, along with knowledge about dimensions of the Venera lander and location of its camera lens. He was able to preserve the original sharpness of the Venera surface pictures. A series of projected views were combined in Photoshop. A few missing spots at the horizon were filled in by duplicated or reversing other portions of the image. "So there is a little artistic license ... but not very much," Mitchell told SPACE.com. A task still ahead is color processing of the Venera imagery. "Fully accurate calibration of the color has not yet been done by anyone," he said. Critical calibration data is coming from Russian colleague, Gektin. Why take a new look at old space imagery? Mitchell said he first worked in space physics, but switched to a career in computer science and image processing. "It's fun to come back to some space science again and also find challenging image-processing problems," Mitchell said. "By challenging, I mean things you cannot just do with Photoshop." Mitchell said he's labored over the reconstruction of the Venera-9 and Venera-10 images. "Currently, I am starting to work on the Venera-9 orbiter images, which very few people have seen." In studying the Venera-series of spacecraft sent to cloud-veiled Venus from the mid-1970s into the early 1980s, Mitchell explained that he's become absorbed in the space history of it all. "It's time to start telling objective stories about all the fascinating things done in the Soviet space program," Mitchell added. "I'm proud of American achievements ... glad to see socialism decline. But I hate it when people make their politics into the subtext of writings about science and history." Mitchell hopes to avoid that issue as much as possible while working on his book on the Soviet exploration of Venus.